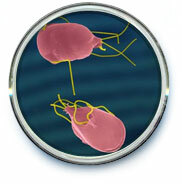 Giardia spp are protozoan parasites. They are found in the faeces of infected people or animals and are spread by water or food. They cause a gastrointestinal disease about 7 to 10 days after ingestion.